Anderson's Maple Syrup, Inc. and Nascar Camping World Truck Series team Joe Denette Motorsports paired up for the second time in 2012 on Friday, June 1 at the Dover International Speedway in Dover, DE. Four-time NCWTS champion Ron Hornaday, looking to get that coveted first win for Joe Denette Motorsports, was the fastest truck in the first practice, and was 14th fastest in the second practice. Hornaday's speed continued, as he qualified the truck in the 3rd spot. While Mother Nature and pit strategy were the name of the game in the early running of the Lucas Oil 200, a mangled mess in a red-flag shortened event was the finished product for Ron Hornaday and his No. 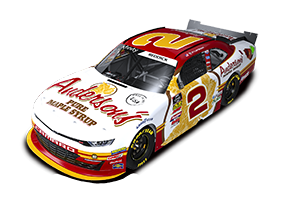 9 Anderson's Maple Syrup Chevrolet at the "Monster Mile." On lap 137, Hornaday got loose coming out of turn two and made contact with the #6 machine and lost it on the backstretch. The #9 Anderson's Maple Syrup Chevrolet sustained major damage to the nose and was forced behind the wall for repairs. The rain picked up and the race was eventually called due to rain, resulting in a 27th place finish for the Anderson's Maple Syrup Chevy Silverado. Click here to listen to Ron's pre-race interview on Sirius XM Radio. Click here to view Ron's spin late in the race.